From application fees to marks sheets, from TOEFL to interviews, find out all about the Harvard University admission requirements for Indian students here! Hello everyone! Application process is a stressful time, there’s so much to remember. Each application has different requirements, different deadlines, and exhaustive processes. I remember the time I was applying for my masters, and along with a full-time (very demanding job), the admission process was super tiring and me, emotionally and physically! 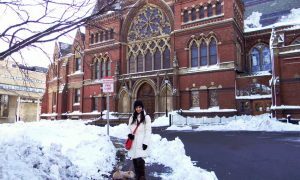 That’s why I have created a basic list of Harvard University admission requirements for Indian students, so you don’t miss out on anything. There are no extra Harvard University admission requirements for Indian students, other than the standardized English language test, which is required of all international applicants. Submit the online application form with required fee. Other than that, submit your GRE/SAT/GMAT score, TOEFL score, college/school marksheets, recommendation letters and personal statement. Some Harvard schools also have additional requirements such as resume, portfolio or interview. So let’s go over the list of Harvard University admission requirements one by one. Most universities have now made digital applications mandatory. Harvard University has had digital applications for many years now. The digital application is the first thing you should submit, because once they formally receive your duly filled in application form, only then are your other application materials like transcripts and test scores accepted by the university’s admissions office. The digital application has to be submitted with the application fee, which may be $90 or so depending on the College or graduate school you’re applying to. You can check the application fee in your school’s website. Some schools may even waive the application fee if requested by students who have financial difficulty paying it. 1. Harvard College requires standardized test scores from either the SAT or ACT (with or without writing). They even recommend submitting two SAT subject tests, neither of which may be the SAT II English Language Proficiency Test (ELPT). 2. Harvard Law School (HLS) requires the score of LSAT to be submitted. 3. Harvard Business School (HBS) and Harvard Kennedy School (HKS) accept Graduate Record Exam (GRE) or Graduate Management Admissions Test (GMAT) test scores. 4. Many Harvard graduate schools such as Ed School and Design school accept GRE scores. So check your school’s website to see which score they accept. Please note that the GRE/GMAT/LSAT/SAT scores need to be sent to the university directly from the testing service, otherwise they’re not reviewed. So be sure to take your school’s institution code with you before you appear for the test. Additionally, make sure to take an early test date so as to ensure the testing service sends your scores to your school before the deadline. Schools only accept recent test scores, mostly a GRE/LSAT needs to have been taken within 5 years of the deadline. So check your school’s website to see if your old score is still vaild or not (they give exact dates). If you’ve taken more than one GRE test, some schools check your scores from both tests to compare your performance over time. So keep that in mind before you make up your mind to take the test again. Also check out: What GRE Score is Required for Harvard University? All international students, including Indians are required to take the standardized English language tests, especially if their native language is English. In India, even if you’re raised as bilingual or went to English-medium school or college, you still need to submit your TOEFL score. 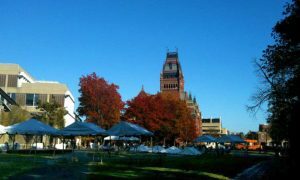 Some Harvard schools also require a minimum TOEFL score from all applicants. So make sure to check that while preparing to take the test. Harvard University admission requirements for Indian students include transcripts, marksheets or grade reports. You’ll need to submit the official transcripts from any previous schools, colleges or universities you have received a degree or credit. 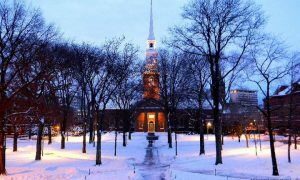 To apply to Harvard College, you need to submit Secondary School Report (including transcripts) and Mid-Year School Report for College. For applying to grad schools, submit a hard copy of your college degree transcripts/attested marksheets, reflecting all the subjects you took, and your marks/grades for each semester/exam. They need to be attested by your college registrar so as to appear official/ authentic. If your college does not issue marksheets or transcripts, submit an official letter from them listing courses and examinations taken, grades, and degrees and dates of degrees received. If you were homeschooled, you may be required to create your own marksheets. Or get a letter from your parents/tutors about the exams taken. Or your scores from any standardized tests/exams you’ve taken. This is one of the most important parts of Harvard University admission requirements for Indian students. Or any student for that matter. Your LoI/SoP should be 1-2 pages long and originally describe your experience, ambition, and why you’re applying to the particular program. It should basically identify why you’re the perfect candidate to be admitted, and how it will help you with your long-term passion or goal. There can be so many tips I can give with writing a winning essay, so I’ll save those tips for another article. But do more research on your Harvard school’s admission website to see what exactly they expect from this letter. Ultimately, this letter sets you apart from other applicants, and helps to seal the deal! Also read: Extracurricular Activities for Harvard Applications: Make It Count! Every Harvard school requires applicants to submit 2-3 letters of recommendation, depending on the school you’re applying to. So check your school’s admission page to see how many are required. They may even specify who these letters should ideally be from. If you have work experience, it’s typically a good idea to submit at least one letter from your employer. If you’re fresh out of college or school, a letter or two from your college dean or senior professor is a good idea. For example, Harvard College application requires two teacher evaluations. Get letters from professors or employer of authority, but those who really know about your work, so that they can give a glowing letter of recommendation. Some schools even call up and ask your recommender to verify the letter or ask further questions about you. Not all Harvard grad schools require applicants to submit a resume. For example, Harvard Business School requires applicants to submit a business resume. Mostly, graduate schools that prefer work experience may require resumes. It may even be optional, so check on your school’s website admission requirements to cross-check. Page Layout: 12” x 18” or A3, two-page spreads should be combined into one page (recommended). Be sure to check the updated requirements at the time of your application before you put together the portfolio. It needs to be submitted digitally, and may even be accompanied with a video portfolio. 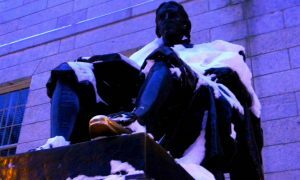 Harvard College and some grad schools allow applicant interviews. Not all Harvard schools recommend interviews as a part of the admission process. So this is something that you want to check on the school’s admission page. Sometimes, the school you applied to may also inform applicants via telephone that an interview is necessary to finally judge their application. But that didn’t happen in my case. For example, Harvard Business School (HBS) invites applicants for 30-minute interviews. If they are invited, they have to participate, either in person or on Skype. So I hope I was able to clarify all Harvard University admission requirements for Indian students. 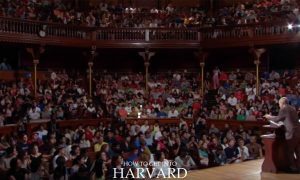 The admission process for Harvard is pretty standard compared to other universities in the US. So if you’re applying to other unis, you won’t find Harvard application specifically a hassle. If you have any more questions regarding the admission process of your particular school, comment below. I’ll try to answer that here or write a separate post. Thank you, this looks very thorough! I have only 2 recommendation letters, do you think i need a 3rd one or are 2 enough? Ahaa, thanks so much for all the helpful info. I’m going to apply this year, taking the GRE in August. What GRE Score is Required for Harvard University?